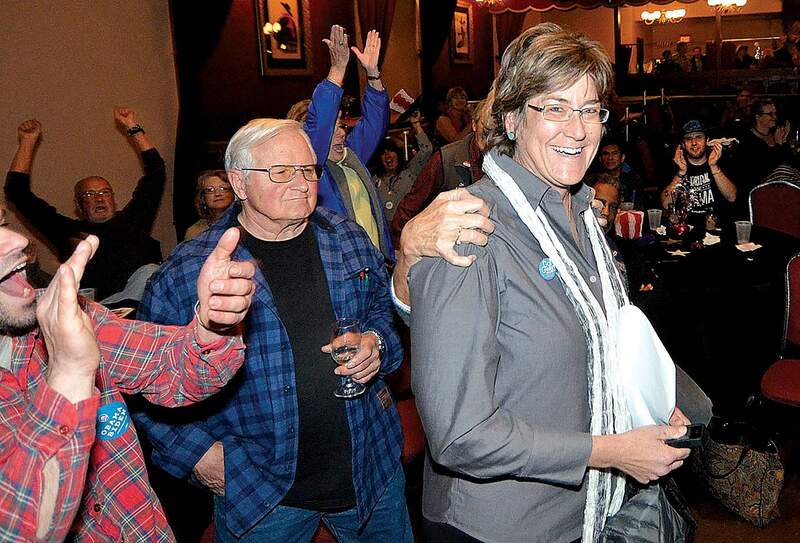 Gwen Lachelt celebrates her election as a La Plata County commissioner in 2012. She was congratulated by Dave Kunz, left. A trio of county residents has launched an effort to recall Lachelt from her position as commissioner. They say her lobbying efforts on behalf of environmental issues are problematic. Three La Plata County residents filed a petition Thursday morning to request a recall election to unseat La Plata County Commissioner Gwen Lachelt. The petition was co-sponsored by Michael Cugnini, Ty Hawkins and David Peters. “Citizens have had a growing concern regarding commissioner Lachelt’s performance for several years now,” Peters told The Durango Herald on Thursday. Peters said some residents believe Lachelt’s lobbying on environmental issues, such as the Bureau of Land Management’s proposed methane venting and flaring rule, is problematic because it overburdens the industry. They also take issue with her employment with Western Leaders Network, a nonprofit she started to serve as a bipartisan platform for local and state officials to connect on conservation issues. Lachelt’s critics have cast her as an opponent of oil and gas operations. On Thursday, La Plata County staff verified that Lachelt has never voted against an oil and gas project in the county since she was elected in 2012. Peters also said they are seeking to unseat Lachelt because her attendance record for county meetings has declined as her lobbying efforts have increased over the past year. According to county records reviewed Thursday, Lachelt has attended 91 percent of county commission meetings. In comparison, commissioners Brad Blake and Julie Westendorff have attended 95 percent of the meetings. In an interview with the Herald on Thursday, Lachelt speculated that the scrutiny of her actions is a result of outside political influences, which started in earnest in May when she went to Washington, D.C., to testify in favor of the BLM’s methane rule. “Let’s make no mistake, outside organizations (such as Americans for Prosperity) funded in part by the Koch Brothers and other oil and gas lobbying organizations are moving into La Plata County to stir folks up, misinform them and to pursue their own corporate agenda to unseat progressive elected officials across the country,” she said. Lachelt, a Democrat, was first elected to a four-year term on the Board of County Commissioners in 2012, beating incumbent Kellie Hotter, a Republican, by a vote of 14,095 to 13,921. She was re-elected in 2016 when she beat Republican challenger Lyle McKnight 15,337 to 14,680. Lachelt represents District 2, which encompasses central La Plata County, including Durango. However, state law allows all registered voters in the county to vote on all county commission seats. Lachelt began being scrutinized last summer when a small number of county residents who perceived a conflict of interest filed an ethics complaint accusing Lachelt of misconduct. A third-party review by the Eagle County Attorney’s Office investigated the allegations. In October, the office found no evidence of wrongdoing. County commissioners did run into some confusion about when they should disclose when they are speaking on behalf of themselves or in an official capacity as a county commissioner, or when they accept paid travel. Commissioner Blake, too, ran into the same problem when he accepted paid travel from Trout Unlimited to go to Washington, D.C., in June to speak with the Environmental Protection Agency about funding issues with the recently declared Superfund site north of Silverton. Blake, a Republican, also was cleared by the Eagle County Attorney’s Office investigation. Taking all these issues into consideration, La Plata County is adopting clearer ethics policies, set to take effect in February, based on the Eagle County Attorney’s Office recommendations. Peters said the breaking point for some residents to push for a recall came when the county released its draft of proposed land-use regulations, which some residents believe are an infringement of property rights. All three county commissioners voted to direct county staff to pursue a land-use code in 2016. Jesse Mallory, state director for Americans for Prosperity Colorado, said he is not specifically aware of Lachelt and her activity. But the conservative group known to launch aggressive and significantly funded campaigns to influence elections and oust Democrats has recently opened a local office. La Plata County Clerk Tiffany Parker said she has seven days to approve the recall petition. If approved, petitioners then have 60 days to collect 7,505 signatures to warrant a recall election. Parker said the process for handling recall petitions usually takes five months. If and when petitioners submit the required amount of signatures, Parker has 15 days to verify each signature. She said the rejection rate is usually high because some people who sign the petition may not be registered to vote or do not properly fill out the petition. As a result, Parker said she recommends petitioners collect 15 percent more than the required amount. In this case, that would require petitioners to collect about 8,630 signatures. If the correct amount of signatures is verified, the petition enters a 15-day period where residents are allowed to protest the recall election. Then, Lachelt has five days to either submit a letter of opposition or chose to resign. Because of the timing of the petition being submitted, a recall election would require a special election to be held toward the end of July. It would essentially function as an entirely independent election with no primaries. Peters said Thursday he was unaware of who would challenge Lachelt if it comes to that.